My cousin gave me this spice box, which he thinks was brought by our great uncle Jake from Russia. What can you tell us about the piece? And how do you suggest we clean and care for it? Thanks. Your sweet spice container was in fact made in Russia. If you remove the top portion, on the rim you'll see the printed hallmark 84, the silver standard of Russia. Unlike silver produced in the U.S. and England, which was usually 92.5% silver, the Russian silver standard was 87.5% silver (written out as the fraction 84/96). On the rim you will also discover the date of the work—most likely in the second half of the 19th century, as this type of piece was popular in Russia from the 1850s until about 1900. This rim should also contain the initials of the assayer, a government appointed "tester" who marked each piece after confirming that it was actually silver. And, if you are fortunate, you will also see a third mark representing the maker. At the time there were dozens of Judaica craftsmen, Szekman, Skarlat, Nast, Reidel, and Kharlop among the most popular. Sometimes a maker would mark (stamp) his full last name, hoping that might lead to additional business-old-school marketing. Other times only the marker's initials were used, or none at all. Value: $500 - $900, depending on size and condition. As for cleaning, filigree should only be polished professionally, as it can easily be damaged or broken. My advice: Leave the piece alone. After all, without additional care, this lovely spice box has already survived 150 or so years. Founder, J. Greenstein & Co. Thanks. Now I can share this part of our family's history with our daughters. Want to know the value of your antique Judaica? Contact Jonathan Greenstein at Jonathan@JGreenstein.com. 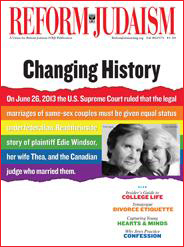 Growing up as a Reform Jew and becoming the first openly gay judge in Canada led Justice Harvey Brownstone to play a role in one of the most important civil rights cases in U.S. history.